The dried osthmanthus flower is sold in many Chinese herbal shops in small bottles. One bottle of it would usually last you a long time because one would only need a few teaspoons of it to flavour a dish. I’ve actually been wanting to try out this recipe since four years ago, when I was still pregnant, but was deterred by online comments about how it might not be good to eat this while pregnant (can’t recall what the reason was). Now that the boy is almost four years old, I finally decided I should get a bottle to make this jelly for everyone at home. 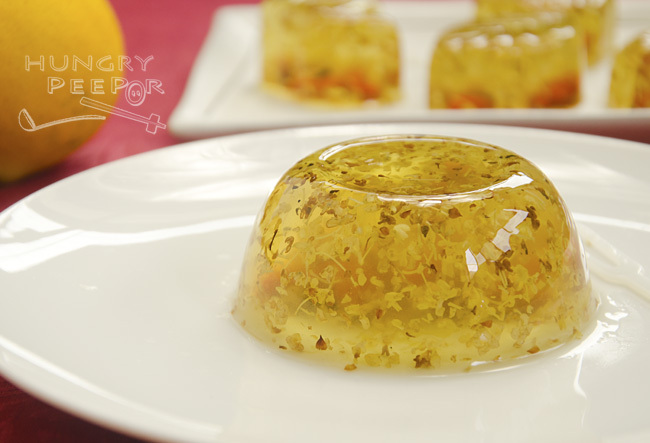 This jelly is really easy to make, in a few simple steps as you can see below. It’s a lovely and dainty little dish to serve your guests too, especially during the Chinese festive season. Add osthmanthus flower. Boil for 2min. Add konnyaku jelly powder and sugar. Stir to dissolve. Simmer till mixture thickens. Turn heat off. Place wolfberries (about 3 – 4 pieces) into each mould. 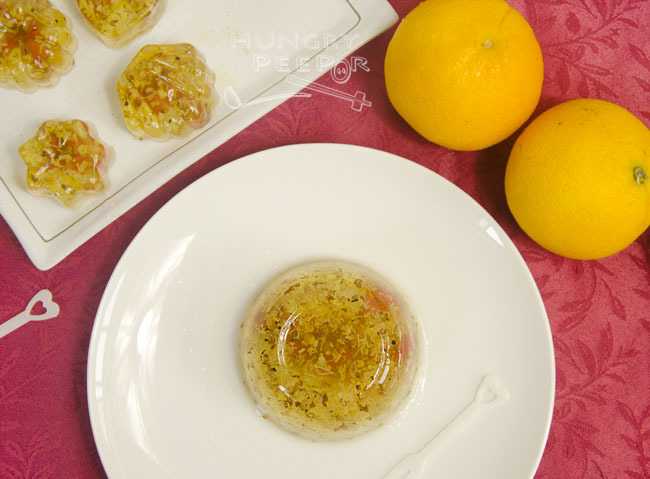 Pour jelly mixture into mold. Leave to cool down for 10min. Then place into fridge to set for 1hr. 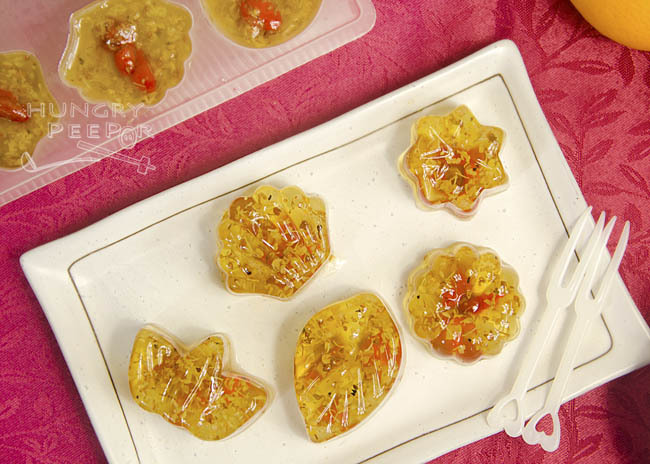 You will need to quickly add the wolfberries into the jelly mixture once they are in the mould as konnyaku tends to set very quickly even at room temperature. The best way to do this is to place the wolfberries into the mold first before pouring the mixture into it. This entry was posted in Chinese, Dessert and tagged Boiling, Chilled, Chinese New Year, Jelly, Konnyaku, Osthmanthus. Bookmark the permalink.